Posted by Andrew Whyman under Electronics, on 26 June 2014 @ 10:26pm. 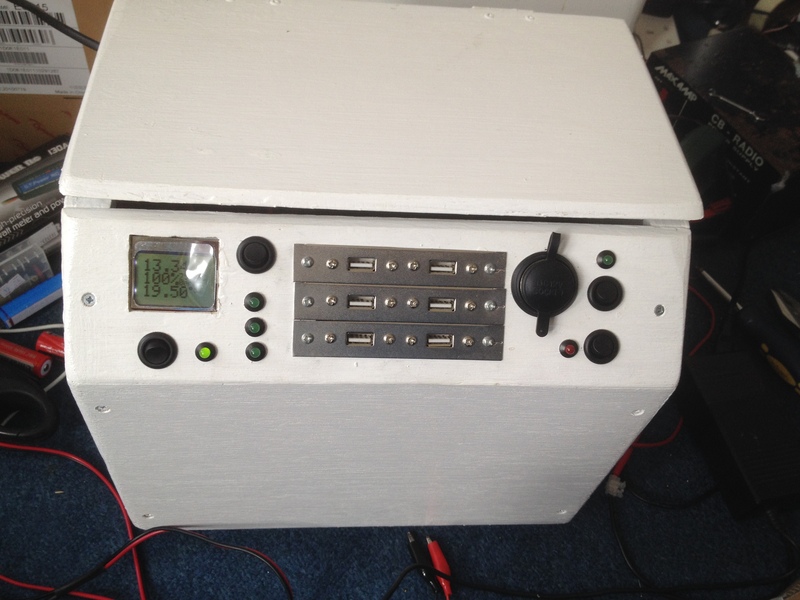 My recent holiday to Le Mans was the first time I’ve been able to properly test the new power box I built a few months ago. For those who haven’t followed the project the idea was to make a smaller more manageable box (one I could pick up without breaking my back) and one that had more USB sockets on it for charging devices. 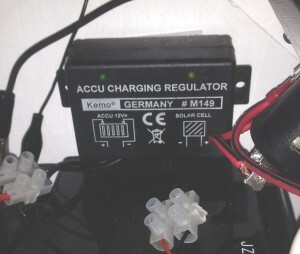 I also added a way to charge it through solar panels which came in very useful on this holiday. I’ll start off by saying it performed better than I expected. There were 7 of us during the Le Mans trip and we were all charging something during the day whilst we were on camp. It charged phones and my tablet as designed, plus through the inverter, a Nintendo DS and a Laptop of some guys who caught up with us later in the week whilst they were travelling the country. During the week I had my solar panels set up. At the moment I have a 10 watt panel and a 20 watt panel which are in parallel to give 30 watts. In order to use the panels I had to add a small charge controller to the box so that the battery didn’t get overcharged by the panels once it was full. This was a small modification that I planned to do once it was ready. The charge controller is nothing special. It’s something I picked up years ago from Maplin when I was first getting into solar charging. Once it gets to 14.2v it cuts off charging and it comes back on again once it drops below 13.2v. It’s not a clever unit like some you can buy that pulse-width the charging to hold the charging voltage. These work much better than my unit, but they also cost more. Now, 30 watts isn’t a lot but for such a small power drain as charging phones it was more than enough. 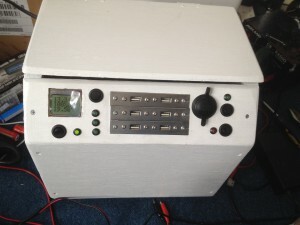 The battery was almost fully charged every day even when using the laptop on the inverter for small bursts. At full output the panels can charge at 1.7A (at 12.8v this is almost 22w but since panels are optimised for 17v, 30w is not achievable without a different charge controller, but that’s another story). 22w is the maximum output I can expect from the 2 panels combined and I think this was regularly reached when we were in Le Mans. It was certainly the center of attention for one person in the group who kept calling it her “pixie box”, and she kept asking if she could have some pixies for her Nintendo DS! Of course, I obliged! The one issue I did have when charging is that all the micro USB cables I have seem to be broken or duff in some way. None of them seem capable of charging my phone whilst it is in use. It’s nothing to do with the box which can happily supply the power as I discovered it happens at home too! I’ve ordered a new cable to hopefully fix this. If it doesn’t fix it then I’ll assume it’s my battery booster case on my iPhone causing it. All in all it was a success. The panels did their job keeping the box charged and it provided plenty of power for everyone to charge their phones. Posted by Andrew Whyman under Life, on 23 June 2014 @ 8:51pm. 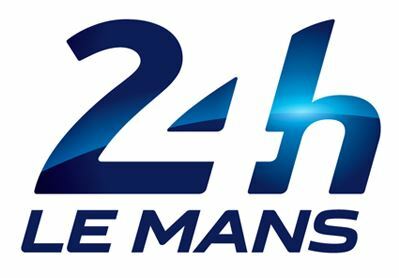 After visiting Silverstone for the WEC the last 2 years, this year I was persuaded by my friends to take a trip to Le Mans for the 24 hour race. For me this involved quite a bit of preparation since it’s the first time I had been out of the country for over 10 years. As such, my passport had expired and I had to go through the lengthy 8 weeks of trauma of applying for a new one – my first adult one as it happened. There is always the anticipation waiting for it’s arrival in case there was something wrong and they refused it. Thankfully for me nothing did go wrong and I got my renewal in plenty of time. Going to France is quite a challenge for me mostly so because of the language barrier. I don’t speak much French at all. I can say hello, goodbye, thank you, count to 10 and that’s about it. Luckily for us, a friend of ours who went with us speaks fluent French so all was well on the translation front providing he was actually with you. He did require a bribe, though he never did stick to that (I’d best keep that quiet…!). This said, with pointers from my friends I managed to muddle through. Most of the people I had to speak to such as those in shops and restaurants actually spoke basic English too which helped when I got stuck. I’m sure they appreciate the effort we put in, but I really do need to learn more than a few words for next time. Anyway, the trip was of course started with the car journey. I wasn’t looking forward to 12+ hours stuck in a car with only one other person for company. I don’t make a particularly good passenger at the best of times (I prefer to drive, but that wasn’t possible this trip). Sitting still for so long makes me ache, and ache I did after we got just half way down. I was fine once we got out of the car though. 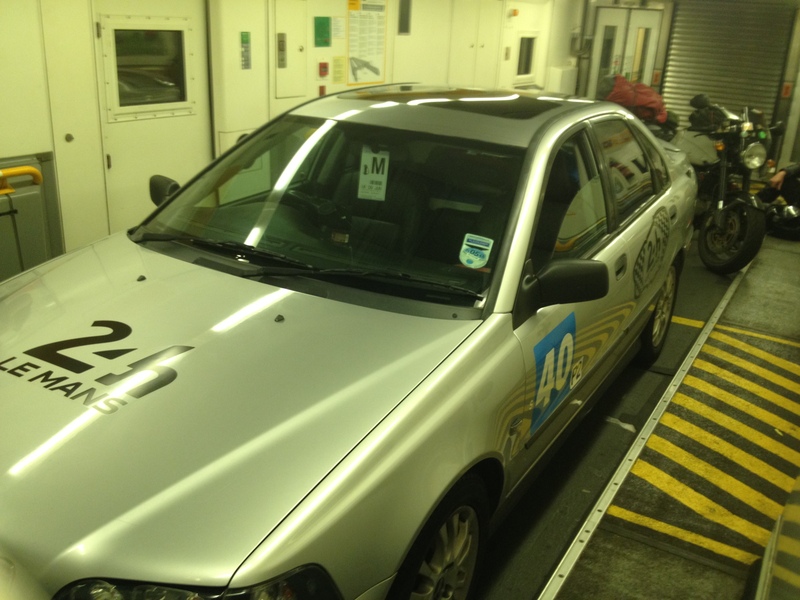 We took the channel tunnel coast to coast since it was the quickest way to get there and the journey was already long enough as it was without messing about with ferries. It was my first time on the train there so it was a new experience. I have to say it was a little different to what I expected but not unusual per se. You could get out of the car if you wanted to and walk around the carriage. I was under the impression you had to stay in the car when you were on it (that shows how little I bothered to look into it before hand too). It was nice to get out of the car for 30 minutes that’s for sure. Once we reached the other side it was back in the car for another 4-5 hours before we got to the town of Le Mans. A few hours before we got to Le Mans I was tired. I’d been up for 24 hours almost by that point and all I wanted to do was sleep. I did drift off in the car a few times but kept being woken up by either Radio Le Mans going to an ad break or the GPS warning us constantly that there are speed cameras on the road we were on (but no specific locations, we did it legally). Once we arrived I was as awake as I would be had I been asleep all night. We set up the tents straight away in the hope of going to sleep. That sort of didn’t work out as by the time we put them up it was around 9am, the sun was up, and the inside of the tent didn’t take long to become like an oven. You try sleeping in a tent that is 40°C inside and you’ll see why! We abandoned that idea and set up our gazebo tent to shade us from the sun. After faffing about for a while we decided to go and get some breakfast from McDonalds and do some shopping. Ordering from McDonalds was my first use of French since we got there. My friends just told me to look for a meal on the board and then stick “menu” after it when you ask for it. Seems easy enough, and indeed it was. “Bonjour. McChicken menu s’il vous plait”. OK so that’s probably not totally correct French but it got me by. They could tell I wasn’t French and helped me out with a bit of English when needed, so all was well. The other guys had done this trip a few times and knew a bit more French than I did so they were a bit more accustomed. I will tell you this, McDonalds in France is much nicer than in the UK. Everything feels fresher and less processed, plus when we ordered everything was made fresh. It hadn’t been waiting on the heated food racks for hours on end. While I wouldn’t have McDonalds for breakfast in the UK, it seemed almost normal in France. Plus it’s only while you’re on holiday so who gives one?! For the beginning of the week we didn’t do an awful lot. We hung around the campsite, we went shopping, but come Wednesday the practice sessions had started so we finally had some of the car action we came to Le Mans for. Even on day 1 we were not disappointed at lack of action at all. 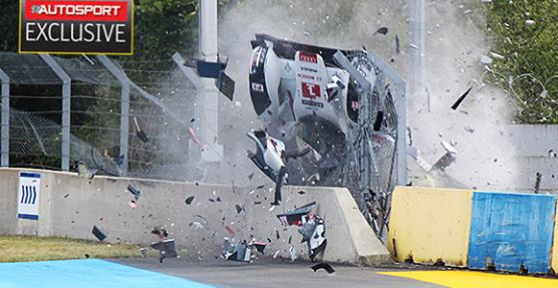 Audi wrote off their number 1 car in a spectacular crash (I didn’t witness first hand but saw pictures online). Thankfully the driver was fine, but he didn’t race this year (someone took over). Audi had to rush to rebuild the number 1 car by Saturday, and they managed it. Audi engineers at their finest! It was interesting to see other parts of the track, as that’s what we did on the evenings leading up to the 24 hour race on the Saturday. Some spots were brilliant for pictures, others were poor mainly due to the sheer number of people that were there trying to get a good view, or fences being between you and the track obscuring the view. I did manage to get a lot of good pictures which you can see on my gallery. The main race on Saturday began at 3pm local time and would ride through to the same time the next day. 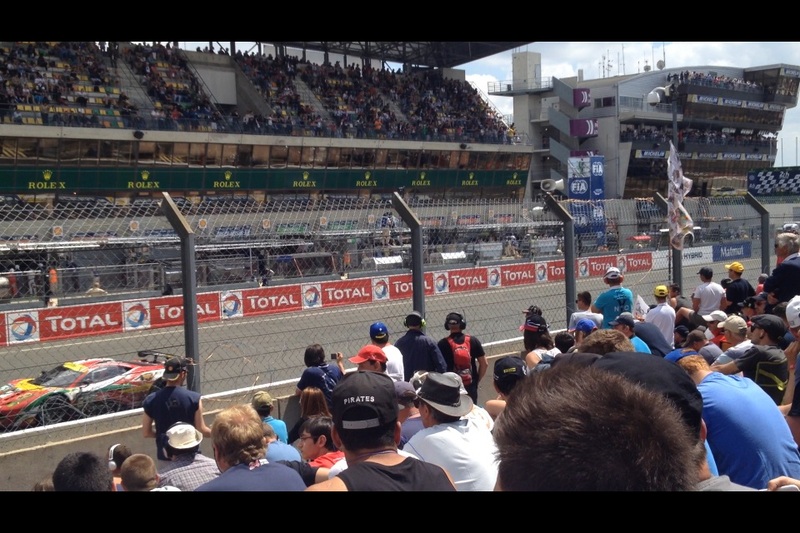 I missed the start on the main straight and chose to watch it at Porsche curves instead. This was mainly because I was burning so much from the extreme sun we had all week. Even with SPF 50 sun cream it was still making it through. I did get a lovely tan off it by the end of the week along with some burning where I hadn’t applied as much sun cream than I did elsewhere. Watching from Porsche curves meant I could go back to the tent when I was getting too hot or I was burning again, since we were camping on the campsite there. By the time the evening came we went to another part of the track for a couple of hours to enjoy the sunset views. I did get some pictures there but my entry level Nikon D3100 doesn’t have very good low light capabilities unless you go to silly high ISO levels. By doing that you get far too much noise in the image making for a terrible photo. The pictures I did take on a lower ISO didn’t come out well at all even with exposure compensation. Next year perhaps I’ll try a higher ISO anyway and see what happens if I have the same camera still. When we got back to camp we went to bed. We had to endure the cars going past the whole night. While some people find it therapeutic, I don’t! I had some ear plugs and my radio ear defenders on to drown the noise out. It didn’t block it out completely but it blocked it enough to get some sleep. I probably managed about 4-5 hours sleep in total that night which is more than I thought I would get being a light sleeper and all. By the time it was 8am the sun was heating the tent up to an uncomfortable level and I had no choice but to get up. Over breakfast we discussed what happened in the race overnight. As it turned out all of the LMP1 class cars had their own share of problems. Porsche were out with failures on both cars, Toyota suffered a complete failure of the electrics in one car and another was still behind after a crash earlier in the race, and Rebellion had minor issues throughout. Audi had both their remaining cars suffer turbo failures, but these were replaced and both cars were leading the field by morning. Needless to say it was a tense overnight race. For the finish we went to the main straight after lunch. The sun was blaring again so I used an umbrella as a shade much to the annoyance of some people sat around me. Thankfully when my wallet decided to drop out of my pocket the guy behind me kindly pointed it out to me, so thank you strange man! It had all my money and debit card in it, so that could have ended up being quite bad. I think next year I’ll split it up and leave some hidden elsewhere or something as that could have been a disaster. I wouldn’t have been without money since I have friends to help out, but it would have been a horrible loss. Finally 3pm came, and after a lengthy race, Audi took the two leading positions followed gracefully by Toyota then Rebellion. Porsche even managed to get a car out for the last lap too. Once the cars were in the pits everyone was allowed to pile onto the track for the closing ceremony. This is a lot different from Silverstone where they wouldn’t dream of letting you on the track at any point. Once that was over though we had a nice walk along the track back to the camp site. On the way we got to see some of the damage the Audi caused to the track wall when it crashed earlier in the week. There wasn’t much left except some large black marks but you could tell from those that it hit hard. The end of the race marked the end of the holiday in a sense. When we got back to the campsite everyone was packing up and leaving. There were only a couple of people staying the extra night. Going home the same day as the end of the race would have been far too tiring so we opted to stay overnight. We did pack most of the stuff that night to save time in the morning. To celebrate the end of another Le Mans the guys all said it was customary to have a fire, so that’s what we did. Anything that could burn that was going in the bin got burned! Sadly we quickly got told off by the ACO (the campsite owners) and they made us put it out. Oh well! The journey home the next day definitely felt quicker than on the way down. Perhaps it’s because we didn’t spend the entire day awake before we left! 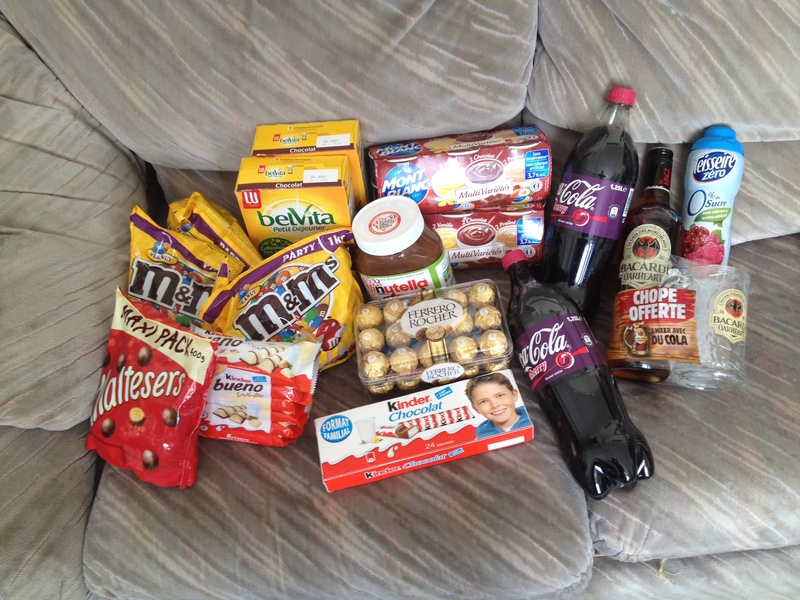 When we got to Calais we went to spend the last of our Euros in the supermarket and stocked up on cheap wine, sweets and chocolate. 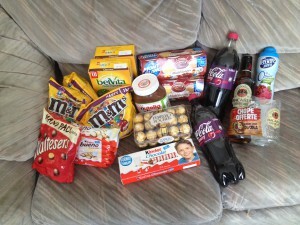 Then in the channel tunnel we went into duty free and spent whatever else we had left. All in all, I enjoyed the holiday a lot more than I thought I would. I’m still new to the sport of WEC but it’s growing on me every time I go to a race or watch one online. I definitely think I’ll be going next year! I’ll also be going to Silverstone again no doubt, and we were perhaps planning to do Spa as well. Time will tell as two trips abroad in a year will be expensive.